It was definitely something interesting to behold. Just before sundown the bats began to flow out from under the bridge in a steady stream, and remained clustered together in a dark, silhouetted trail that reached across the sky for miles (pictures don't do it justice). It turned out to be a very pleasant and unique family experience. We arrived at the bridge about a half an hour before sundown, and so had time to take a stroll by the lake during that golden hour before dusk. Then we found a place to sit together on the lawn and listened as the high frequency bat noises grew louder and louder and a few began to trickle out from under the bridge. For the next fifteen minutes or so they continued to fly out, and we chatted and watched. 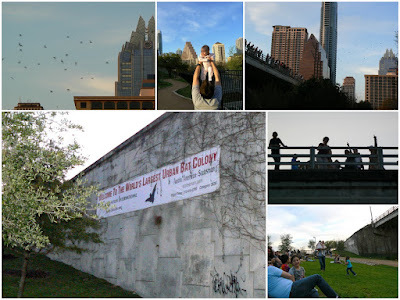 Apparently, March is not the most exciting time to view the bats. (There aren't as many as there will be as the summer goes on). I imagine we will go back another evening later in the season to see them again. Does your hometown have some frugal, unique activities or locations? It would be interesting to hear about them!